First - re low temperatures this morning. We had another below freezing morning here at house, with low of 31F. it appears that the airport was 14F warmer with a low of 45F. The models still have considerable differences in their precipitation forecasts for tomorrow and Friday. Above is the 66-hour forecast from this morning showing NAM forecasted precipitation through 11 pm Firday night. the NAM forecasts precipitation over the northeastern half of state, with none forecast here in the Tucson area. The same forecast from the GFS (below) predicts a nice rainfall event over all of Arizona, except for the far southwest corner of state. The early run of Atmo's WRF-GFS (is somewhat similar to the GFS from which it was initialized) is shown below, with it's precipitation forecast through 11 pm Friday night. The WRF forecasts much less precipitation across southern Arizona than does the GFS. The WRF focus for this event is in the Rim country to the north. So, pick your preference and keep your fingers crossed. Cutoffs Over The Southwest - For How Long? First - lot of cirrus around today but no middle clouds. 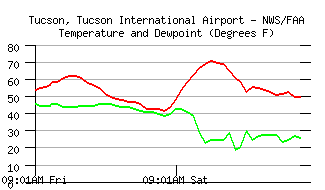 Low here at house this morning was only a bit warmer than yesterday at 33F (TUS had low of 45F - also a bit warmer). The strong 500 mb short wave (currently northwest of Seattle) is forecast by all the models to dig into the Southwest during the next two days - this in response to strong, upstream ridging. The cutoff takes a south-southwestward track over land - which is usually not good for extensive precipitation at low elevations. The 72-hour ECMWF (valid 12 UTC 2 Dec 11 - Friday) forecasts the 500 mb low to be nearly over Yuma. The interesting thing in the ECMWF forecasts is that two more short waves drop down the west side of cutoff, keeping an evolving cutoff over the Southwest. Below is ECMWF at 168-hours (12 UTC Tuesday, Dec 6) with a 500 mb cutoff still forecast nearby - now near San Diego. The longer the cutoff(s) have a fetch from over the Pacific, the greater the chances for pulling in better moisture for precipitation - so a very interesting week on tap. In the shorter term - at 84-hours - the NAM model (above) forecasts the accumulated precipitation mostly over the mountains. In contrast, the GFS forecasts a significant precipitation event to occur over over central and eastern Arizona. Which will prove more accurate? - a tough call with the culprit short wave still a long way away. The 2330 UTC water vapor image (above) indicates a large cloud mass from our north off to our southwest. 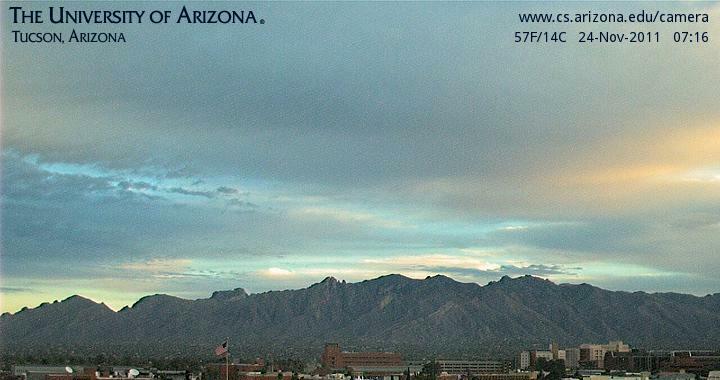 The debris from this cloudiness (associated with a weakening 500 mb short wave that will be brushing by northern and eastern Arizona) will affect the state tonight and tomorrow with cirrus and perhaps some middle cloudiness. The clouds should keep lows a bit higher tonight than they were this morning. Here at the house this morning we had a low of 30F with light frost, while down at the airport the low was only 42F. 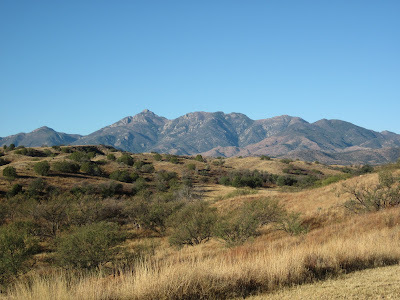 The Santa Rita Mountains looking toward the west - not a hint of any snow cover. The low foothills are very brown, except that the trees are still bright green. 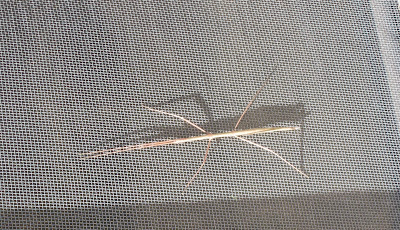 A walking stick sunning on a window screen. 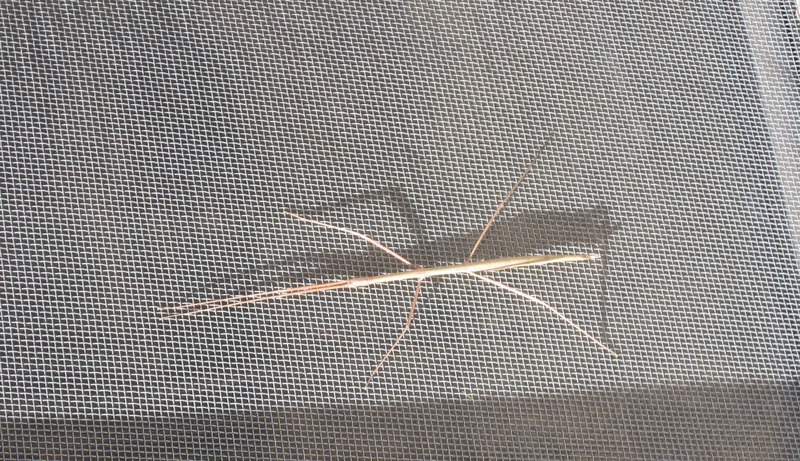 Note that he/she is in winter colors of shades of brown. 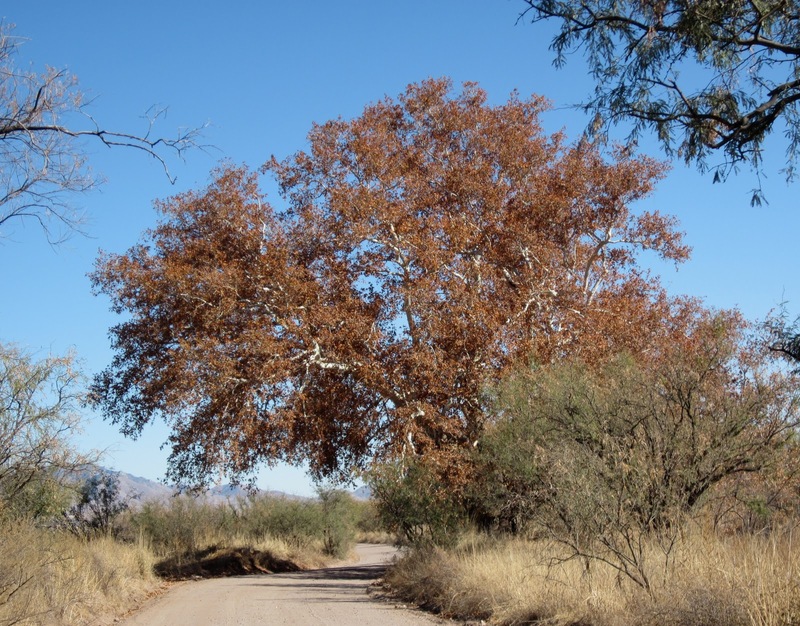 A beautiful and stately Arizona Sycamore tree in its fall colors. This shot is looking east along Gardner Canyon Road. 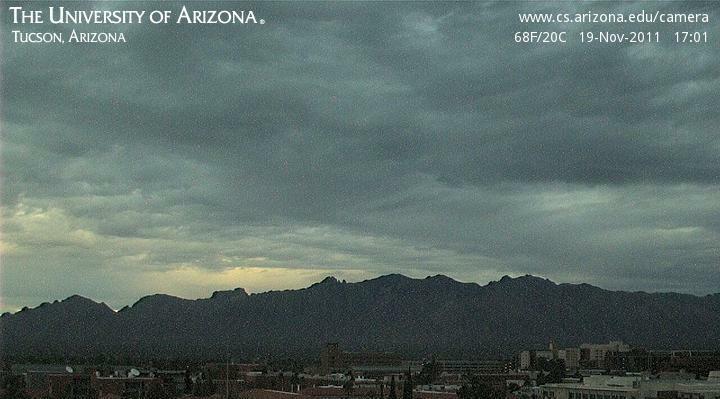 Very windy here at house this morning, with some gusts of 20 to 30 mph coming right down the Rillito. The 6 am MST surface plot for Tucson metro (above) indicates strongest winds coming over Redington Pass and down into this part of town. Winds along the I-10 corridor were not as strong as forecast by the WRF yesterday (previous posts). 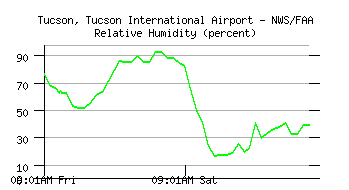 However, at 6 am the low temperature at TUS had been down to only 50F. The temperature time series for TUS (below) shows how different the nighttime temperature trace was than that of the night before. So, the WRF temperature forecasts were quite accurate, once again. 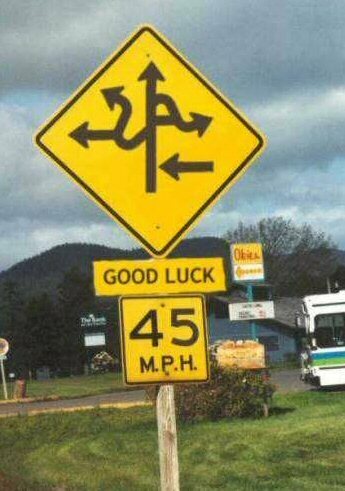 Here at the house, the situation was considerably more complex. The temperature at 6 am was 47F with the wind blowing. However, at some time during the night the low had dropped all the way down to 36F. I just have a max/min thermometer, so I don't know exactly when the wind kicked in. The RH time series for TUS (above) indicates that the RH stayed low all night - as well evidenced by the show of very bright stars here at 6 am. The time series of wind speeds on the roof at Atmo (5 to 6 stories above the ground) is shown below. 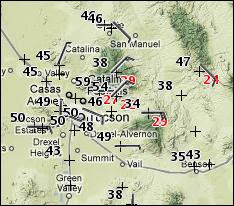 The winds kicked in at Atmo around 10 pm last night and some gusts since then have been as high as 40 mph. So it has been yet another very challenging, low temperature, situation across the metro area. We have been out near Sonoita (Santa Rita Abbey, about 5 miles to the northwest of Sonoita) in the low, eastern foothills of the Santa Rita Mountains. Winds were calm out there at sunrise this morning and there was a heavy frost. Here at the house it appears that winds were also calm, as the low was 33F. As for tomorrow morning - see previous post - the Atmo WRF model is still forecasting strong winds to develop during the night from the east. The above is the WRF-GFS forecast of surface observations across the Tucson metro area at 6 am MST tomorrow morning (Sunday, November 27th). Winds are forecast to be northeast to east-southeast at 20 to 30 mph - except in the two light wind eddy areas immediately west of the Catalinas and Rincons. The WRF forecast low temperature for TUS tomorrow morning is 51F versus the current NWS forecast of 41F. So it will be interesting to see how these forecasts play out. Of course, here at house it will colder, but how much will depend on what the wind does here. 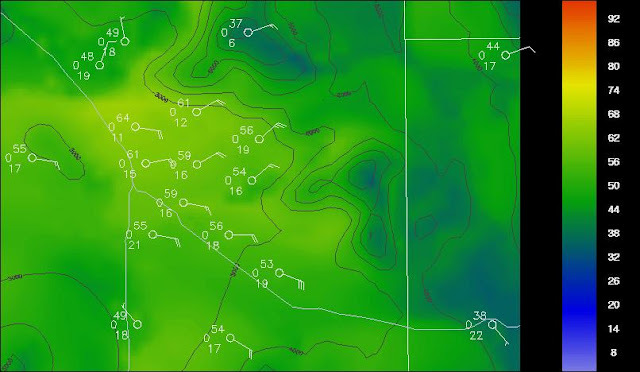 This afternoon southeast Arizona is experiencing gusty, northwest winds (see 2pm MST surface plot above) behind the cold front that is now over in eastern New Mexico. High pressure over the Great Basin will build southeastward and push far south down the eastern coast of Mexico. This sets up an interesting situation with the western (back) part of the frontal zone associated with the cool high ending up out to the west in the lower Colorado River Basin (see NAM 850 mb 48 forecast for Sunday morning below). As this happens, the surface winds across Tucson area will become northeasterly to east-southeasterly and quite gusty Saturday night - this change will be somewhat similar to a backdoor frontal passage. At 6 am MST on Sunday morning the Atmo WRF-NAM forecast (below) indicates strong east-northeast to east-southeast winds across the metro Tucson area of 20 to 30 mph. The WRF-NAM forecasts a low of 43F tonight for TUS but jumps that low to 54F during Saturday night. Quite a change. Rain was more widespread during the night than expected. Rainfall was measured at 90% of the ALERT guages, with only the western sites not having rain. Coverage was 100% for the metro gauges, TUS, DM, Atmo, and here at house. We had 0.43" here and Atmo had .25". Amounts were generally light, with only 13 of the ALERT gauges having 0.25" or more. Regardless, a much better rain event than was the previous one. Highest amounts were off in the far southeast corner of state, just as forecast by the models. Douglas had 0.68", Rucker RAWS 1.14" and Hachita Valley, NM, RAWS 1.19". Photo above shows Kitt Peak in the clouds this morning. Taking a long look ahead - at 168-hours from 00 UTC last evening (i.e., 5 pm MST next Thursday afternoon - December 1st) - the operational 500 mb forecasts from GFS (above) and ECMWF (below) are quite different. The ECMWF forecasts a much more intense cutoff west of California. Heights are more than 250 m lower in the core of the cutoff in the ECMWF forecast. Edited at 1 pm MST to add: The new 1200 UTC forecasts from this morning show that the GFS forecast has significantly changed and is now converging with the ECMWF. Additionally, the ECMWF forecasts a strong and very cold surface high (see below) to invade the north-central U.S. So, more interesting weather to watch next week. The blended PW product this afternoon shows a broad push of higher PW moving into southern Arizona. The GPS time series for stations across southern Arizona show the rapid increases of PW occurring this afternoon. Strong southerly to south-southwesterly winds of 15 to 25 mph are blowing from Sasabe over to Empire. 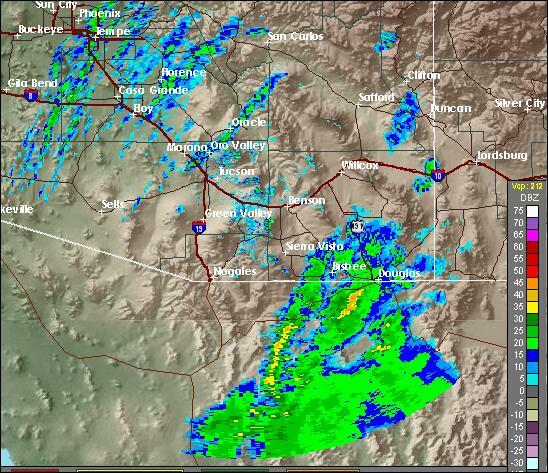 Composite radar at 2:30 pm MST (below) indicated light showers over south-central Arizona, with heavier showers moving into far southeast Arizona. Has gotten interesting more quickly than I expected, and it will be interesting to see what evening brings. 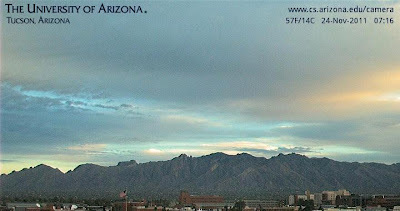 Thanksgiving Day dawns with broken cirrus and scattered middle clouds here in Tucson area. - so day looks to be cloudy and mild. 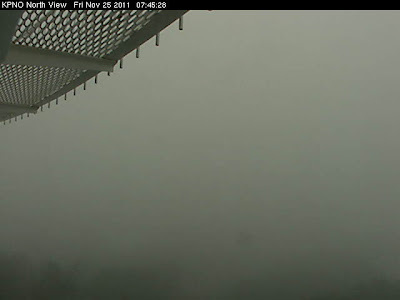 Low here this morning 40F, compared to yesterday's freezing temp of 30F (TUS had 48F this morning and 43F yesterday). The blended PW product is shown below for early this morning - the subtropical moisture intrusion is now present, but with the higher PW pointed off toward southwest New Mexico.There also appears to be a nose of values 15 to 25 mm up the GoC, and this may support some showers over much of southeastern Arizona late today and tonight. While the models were off a couple of days ago on exactly where the subtropical moisture plume would be centered, it is quite something that models started picking up the subtropical plume on the global forecasts 6 to 7 days out. The morning NAM forecasts the 500 mb (below) trough to come across Arizona, as an open wave, during the night. The next weather system for the Southwest (except for a windy, front about mid-week) will apparently be out at 7 to 10 days, around the first weekend in December. The current NAM forecast of total precipitation through noon tomorrow is above, while QPF from the early run of Atmo's WRF-GFS for the same period is below. The forecasts are basically similar, but the higher-resolution WRF indicates quite a precipitation event for the Chiricahuas, and also a decent event over and north of the Catalinas. So it appears to be a close but no cigar event for Tucson metro. However, there are very strong southerly winds at and below 700 mb ahead of the Pacific trough, so some continued monitoring of the situation would be prudent. The new NAM forecasts this morning (Wednesday 23 Nov. 2011) shift the forecasted moisture plume eastward, so that only the southeast border area of Arizona is affected by precipitation. The current forecast indicates a substantial precipitation event for northern Mexico and much of New Mexico. Shown above is the 60-hour forecast of total precipitation through 5 pm MST on Friday. The early Atmo WRF-GFS has shifted the precipitation event completely east of Arizona. 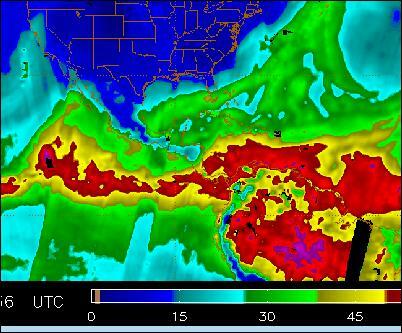 The forecast moisture plume is not obvious as yet in the blended PW product shown below - from 1248 UTC this morning. There are some PW increases west of Baja, but a northward plume of high values has not yet developed. So, a somewhat strange situation continues, with d by dt of the model forecasts being substantial, even at these short ranges. Finally, once Cat. 4 hurricane Kenneth has weakened as quickly as it intensified and is now a Cat. 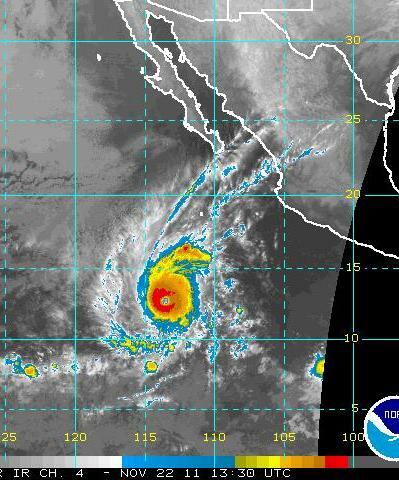 1 hurricane moving westward - see IR image below. A very difficult forecast situation has developed for Thanksgiving through Friday morning. The models have been consistent in forecasting a plume of moisture from low-latitudes (apparently triggered by now Cat. 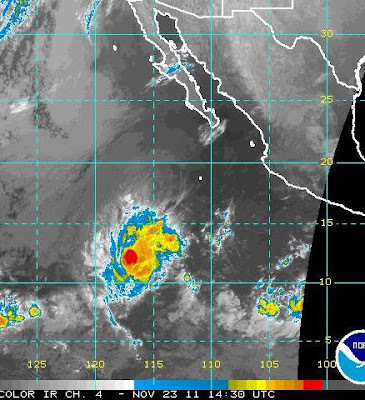 4 hurricane Kenneth) to advect into the Southwest. This occurs ahead of the Pacific trough that will move into the Southwest on Thursday, with resultant (in the forecasts) heavy precipitation. 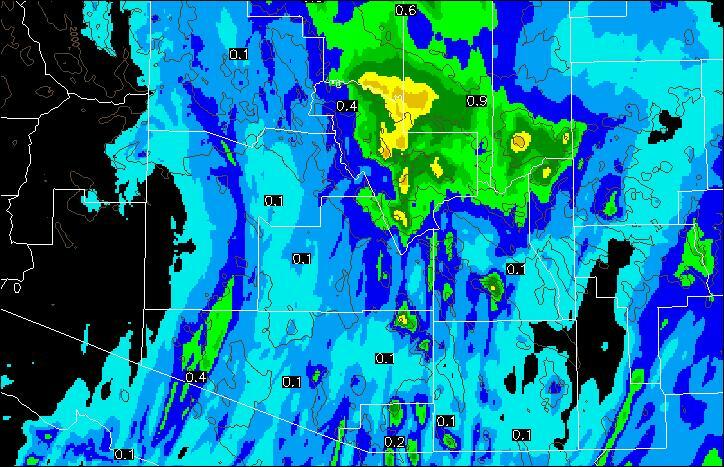 Shown above is NAM 24-hour precipitation for period ending 5 am MST on Friday morning (forecast from 18 UTC data). 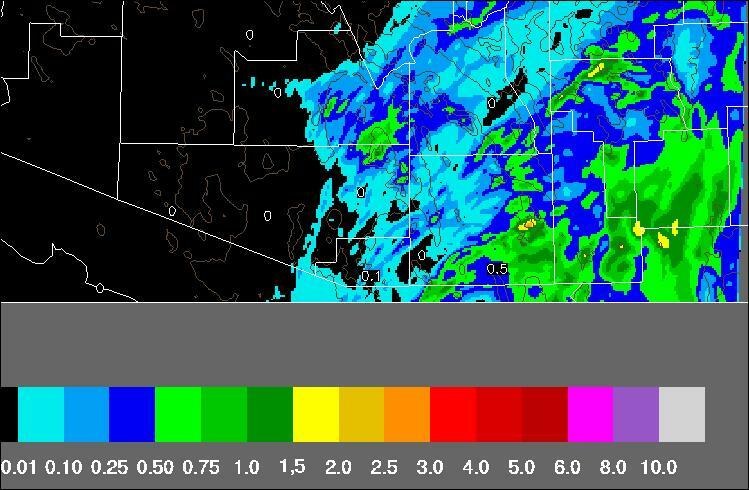 The Tucson area is in a strong gradient of precipitation, with most significant amounts off in the southeast corner of the state. The corresponding GFS forecast is shown below, with the significant precipitation forecast to avoid Arizona and impact northern Mexico and southern New Mexico. This morning's early run of the Atmo WRF-GFS model forecast was similar to the NAM - with a strong gradient of QPF, ranging from 2.5" over the far corner of Arizona to zero at TUS. All of this is difficult to evaluate, since the forecated moisture plume has yet to become apparent in blended PW products. So, will it materialize? How much of Arizona, if any, will it eventually impact? All of this at less than three days out, indicating that the models still have much uncertainty at large scales for some synoptic situations. Hurricane Kenneth has become quite notable, as it intensified rapidly during the night. NHC says it is now a Category 3 storm. Thus, Kenneth is the 6th major hurricane to occur in the Eastern Pacific this hurricane season. Additionally, Kenneth has developed later in the calendar year than has any other major hurricane during the era of satellite monitoring of the Eastern Pacific. Kenneth is forecast to continue moving westward, but it may play some role in the subtropical moisture that most models are forecasting to occur on Thanksgiving. 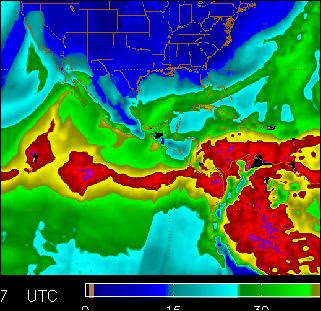 This surge of high moisture would affect portions of Arizona, New Mexico, and northwest Mexico. 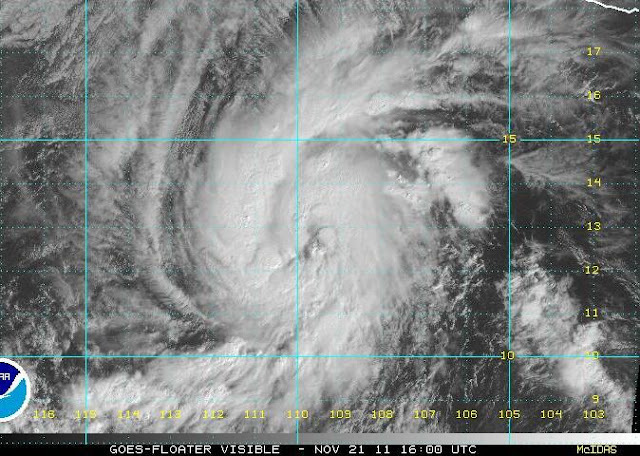 The NHC has upgraded Kenneth to a Cat 1 hurricane this morning - current visible image of the storm shown above. Not clear whether Kenneth could be associated with the forecast Thanksgiving Day moisture plume. 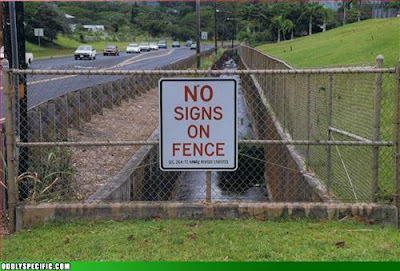 See previous post below. The 500 mb short wave currently moving across northeast-east Arizona brought a band of light showers across the Tucson area before sunrise. The early WRF at Atmo indicates event is mostly over, except for some early afternoon light showers. Here at the house we had 0.03" when I read the gauge at 7 am MST. Across the ALERT network only 18 sites measured light precipitation. TUS observations did indicate a thunderstorm in the vicinty as the band moved through. The new NAM forecasts this morning indicate the next system will affect Arizona on Thanksgiving. The 500 mb forecast valid at 5 pm on Thanksgiving is shown above. Forecast indicates a short wave in Arizona and southern California that's similar to today's, wrt the strength of the associated vorticity. However, the 700 mb forecast valid at 5 am MST on Thanksgiving (below) indicates that this next system will pull moisture from low latitudes into Arizona ahead of it. Note the long fetch of the winds from the subtropics. The NAM precipitation forecast for the 12-hours ending at 5 pm MST on Thanksgiving is shown below. The model forecasts a significant precipitation event well ahead of the short-wave trough at 500 mb, associated with the low-level plume of moisture. Certainly something to monitor as the Holiday approaches! 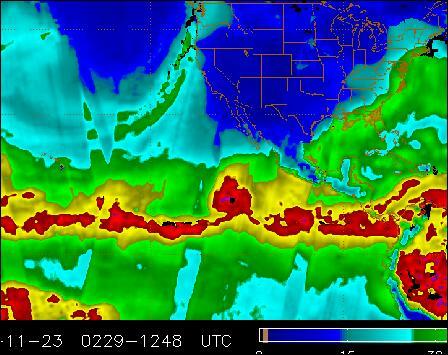 Unusual, November Tropical Storm, Kenneth, is shown in the IR image above. Kenneth is forecast to strengthen some over next 48-hours as it moves off toward the west. Has been a gray and dreary afternoon here in Tucson (see above), as abundant high and middle cloudiness streamed in from the Pacific. Current water vapor image (below) shows a broad, trough at low latitudes, which has pulled the cloudiness in ahead of it. Note that there are two, unusual, upper-tropospheric waves west of San Diego, that have been very persistent as they roll eastward. The strong cyclone off of northern California is quite impressive at this time in staellite imagery. The 12hour (valid 5 pm this afternoon) NAM forecast for 500 mb (above) shows the northern short wave and the broader trough to its south and southeast. Models forecast the northern feature to weaken as it moves across Arizona on Monday, with perhaps a brief round of light showers. A stronger system may impact the Southwest on Thanksgiving Day - but the various models are bouncing around for the Holiday, as per discussions on the SUNY MAP board re chance of strong winds during Macy's parade. 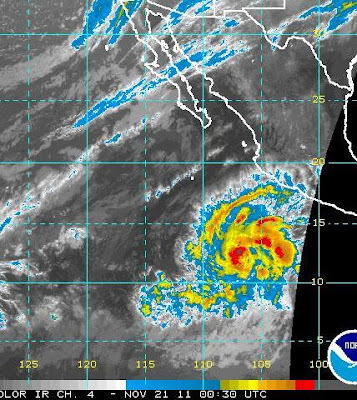 Finally, a November tropical system has developed in the eastern Pacific - TD-13E. First NHC fiorecast for this TD is shown above, indicating some strengthening and possibly a hurricane in its future.